It’s a very sad day as we’ve finally had to admit to ourselves that Moakie is no longer with us. She was 20 years old and born in 1992 at Olympic Cellars when it was located in Sequim. And, I am told she is survived by one of her kittens from her only litter. I met Moakie in 1999 when we purchased the winery and learned very quickly that this was “her” territory and “her” barn. Her winery duties included mousing and greeting guests. Her leisure time revolved around the seasons. 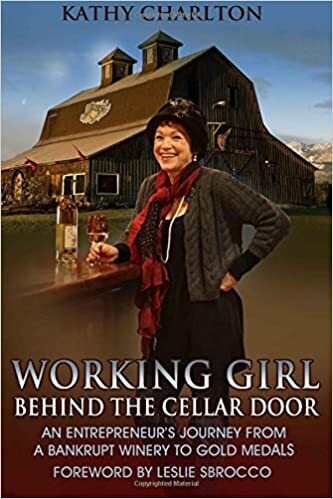 Spending her time outside when it is warm on the South side of the barn and stretched out on our couch in the tasting room as the weather turned cold. About two years ago she decided to retire from her winery duties and took up residence in the eve of the barn. We moved her water, food, litter box and other cat essentials close to her burrow. She no longer came down to visit us and her night roaming decreased… no longer did we find hair balls on the top of wine pallets. Her inner clock was still working up until the last few months because around 5 p.m. we would always hear her guttural meow… maybe saying good night or telling us to come up and check her food supply. As Moakie became more of a recluse we would crawl under the eve to check on her, sometimes getting close enough to talk to her and maybe a little petting. Then there was silence, no more meowing. We’ve hunted, called and crawled through every inch of the barn. I’ve been told cats know when it is their time and probably left the barn. We’re surrounded by fields which were her favorite hunting grounds. I can still picture her, patiently waiting in that "cat stance" for the unsuspecting mouse. We will miss you, Moakie, We love You. We Picked Three Cheddar, Why? .... For This Weekend's Wine and Cheese Tour. The answer... after exhaustive tastings, they were the best examples of that magical taste experience when wine and cheese compliment each other perfectly! We laughingly say... "Wine and cheese tastings. It's a tough job but someone got to do it." And it is a tough job, let me walk you through our process. First Molly, Lisa and I commandeered the Gathering Room. We opened 10 of our wines (white, reds, old favorites and new releases). Then let the reds breathe for a bit. Second we tasted through all the cheese samples from Golden Glen and picked (scored) our favorites based just on the cheese merits. 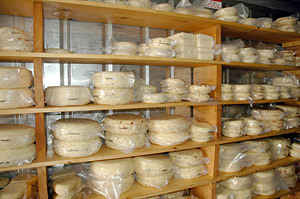 15 Cheddars - natural, raw, length of aging, sharpness and flavors. Third we taste the wines and the cheeses we selected one at a time. This is a very lengthy process. You put a piece of cheese in your mouth, let it soften into a "slurry" and then taste the wine. Fourth we rank each wine/cheese tastings under 3 categories: Doesn't work, It's OK, It's a Keeper. As an example: we started with Chardonnay and sampled this wine with about 9 cheese selections. Then we tried La Galopine with the same cheeses... and so forth through the reds. Of course we had to take breaks and drink lots of water. When you find the perfect pairings, you just know it. Me... I'm smiling with remnants of the cheese and wine on my tongue... trying to sputter"This is It". I knew when the pairings were right but Lisa and Molly would have lengthy discussions on the flavored cheddars and the nuances of seasonings in cooking. Why they would pair a white wine with a chicken recipe seasoned with "X" but choose another wine with chicken seasoned with "Y". Golden Glen Sweet Basil Cheddar and Olympic Cellars 2009 La Galopine (Roussanne/Viognier Blend). Pleasantly sweet and temptingly delicious. Our La Galopine has a nice florally expression due to the Viognier grape, which I particularly like. The sweet basil in the cheese compliments that floral character. It draws it out. If the cheese didn’t have the basil, it would still be fine with the wine, but not exceptional. Golden Glen Chive & Onion Cheddar and 2009 Dungeness Red Lemberger. The “spice” in both the wine and cheese create a fabulous complimentary pairing. The Dungeness Red is an acidic red wine. A lot of Italian Reds are acidic. They tend to pair with either more acidic foods or fatty foods. Cheddar cheese is both acidic and fatty, so combine that with the earthy flavors of the onion and herby flavors of the chive and you have a match. Golden Glen Signature Cheese, River Cheddar and Olympic Cellars New Release 2008 Cabernet Sauvignon. A double-cream Cheddar that is aged at least one year. The River Cheddar is smooth and creamy with a little tang. It brings out the fruity fullness of our Cab, but doesn’t overpower the wine. It may seem counterintuitive, but bold red wines tend to pair with creamy but mild cheeses. What Makes Golden Glen Creamery So Special? and sample a variety of Golden Glen's farmstead cheeses. For Starters, it comes from a local herd of cows just a moo away, grazing in the picturesque Skagit Valley. Golden Glen Creamery is a family-owned operation on the Vic Jensen & Sons farmstead, all farmed sustainably using many organic principles. The farm has been in operation for well over 40 years and has survived low milk prices, high feed and fuel prices, devastating snowstorms, and floods — held together by the family’s will and passion for farming. Vic and Judy Jensen come from a long line of dairy farmers and now are sharing the legacy with their children and grandchildren. Today, there are three generations of Jensen family members living on the farm. The Jensens’ milk cows are mostly Holstein, but include Guernsey, too. Vic and Judy Jensen originally started the dairy with Guernseys only but, by the 1980s, banks typically wouldn’t loan to a dairy farmer that didn’t keep Holsteins (known for their productivity). The Jensens, however, have kept Guernseys in the mix because of the additional cream they give and also for their more docile, friendlier nature. The he rd is a closed-herd, meaning all the milk cows are born and raised on the farm with none brought in from the outside — a good safeguard against disease. The cows are pastured during the spring, summer and early fall, then during the winter they’re housed in an open-air barn to help reduce the number of foot problems that occur with saturated ground. Along with pasturing, Doug Jensen supplements the herd’s diet with homegrown hay, corn and grass silage, as well as grain and alfalfa from eastern Washington. The farm does not use rBST (genetically engineered growth hormones) to produce its milk and selectively and carefully administers antibiotics only to those cows that otherwise would die from an easily treated infection or illness; Brandy Jensen believes it’s the humane thing to do. If long life is an indicator of health, the Jensen cows have a story to tell; the average American cow may live to be about 6 years old while some of the Jensen’s cows have lived to 16! Brandy credits the way they treat their cows and the wholesome environment for their long lives. 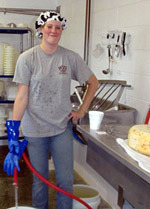 In 2006, the Creamery started bottling its own milk in old-fashioned, glass bottles, continuing its all-natural approach. The glass can be reused up to 40 times, reducing toxic emissions from manufacturing plastic jugs, and then can be recycled — the “3R” concept in action. The Jensens feel the glass also gives the milk a more natural, nostalgic, appealing look and keeps its original flavor alive without any leaching from plastic jugs. Golden Glen also uses a gentler method of pasteurizing called slow batch pasteurizing. This creamery understands that milk “bruises” just like fruit the more it’s handled, so they handle it as little as possible to keep its fresh flavor. Golden Glen also does not fortify its milk, and even the chocolate milk and seasonal egg nog are made from traditional, home recipes — no artificial flavors, coloring, preservatives, stabilizers or emulsifiers. Golden Glen Creamery and the Jensen family provide to the public only what they’d put on the table for their own families: healthy, all-natural dairy products that taste and look the way they should, from their family to yours. Naturally! Visit Olympic Cellars during the Northwest Wine & Cheese Tour for a magical bovine experience. We're very excited to host a family owned Creamery, Golden Glen, of Bow, Washington during our event on Saturday, April 14th and Sunday, 15th from 11 - 6 p.m. each day. Molly, Lisa and I did some arduous duty pairing our wines with a variety of the amazing Golden Glen cheeses until we found three delicious combinations that had us "resampling" a few times just to make sure we got it right! One of my favorites is our new release 2008 Cabernet Sauvignon with Golden Glen’s double-cream, River Cheddar, their signature cheese. You have not tasted cheddar like this before... double cream, which means they add extra cream to their already outstanding milk to create an extraordinarily rich cheese. The marriage of wine and cheese in your mouth has you closing your eyes and just concentrating on the incredible flavors. We are excited to host, Jeremy Kindlund, long- time Golden Glen associate, who will take you through the process of making, serving and pairing cheese. Don't hesitate to bombard him with all your cheese questions. Our cellar will be decorated with Magical Bovines painted by our own artist in residence, Kristi Knowles. These cows are magical because cheese is magic and it comes from cows. Therefore, Cheese is Bovine Magic. Kristi has taken a bit of artistic license with the cows she's painting... a real photo-opt. Sip Wine, SAY CHEESE! So, bring your camera and submit your photo to the Olympic Peninsula Winery Association Facebook page. The top 3 entries will be posted on the Facebook page and website and receive a pair of tickets to the Harvest Wine Tour, Nov. 11-13, 2012. And not to be out done on the culinary cheese front, local Chef, Dave Long of Ovenspoonful will create for us a sumptuous, Wine and Cheese soup. He will begin by roasting garlic and onion, which he will add to a roux base. Then pounds of Golden Glen Cheddar and bottles of Olympic Cellars Chardonnay 2009 will transform into a velvety soup garnished with savory, Italian-herbed, focaccia bread croutons. All to be sampled with local artisan bread and oh, so fresh creamery butter from Golden Glen. Try it with our Gold Medal winning Chardonnay! Wine and Cheese, Spring and Sunshine and Magical Bovines. I can't wait. We're so looking forward to hosting you at our event. Advance tickets for the self-guided tour are available online for $30, and entitle the holder to a commemorative wine glass and wine and cheese tasting at all eight wineries. Independently, each winery charges a $5.00 tasting fee. You must be 21 or over to purchase tickets and/or participate in wine tasting. All ticket sales are non-refundable.